Explanation: Have you watched the Perseid meteor shower? Though the annual shower's predicted peak was last night, meteor activity should continue tonight (August 13/14), best enjoyed by just looking up in clear, dark skies after midnight. Of course, this year's Perseid shower has the advantage of being active near the August 14 New Moon. Since the nearly New Moon doesn't rise before the morning twilight many fainter meteors are easier to spot until then, with no interference from bright moonlight. 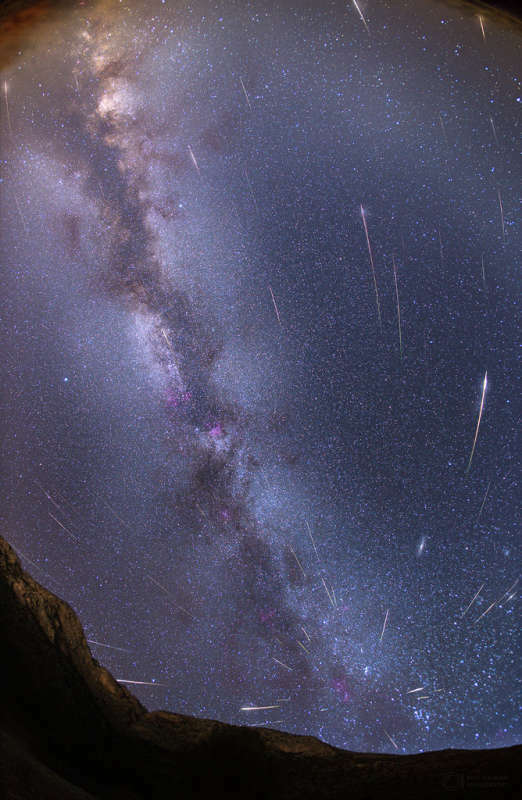 The Perseid meteor shower last occurred near a New Moon in 2013. That's when the exposures used to construct this image were made, under dark, moonless skies from Hvar Island off the coast of Croatia. The widefield composite includes 67 meteors streaming from the heroic constellation Perseus, the shower's radiant, captured during 2013 August 8-14 against a background of faint zodiacal light and the Milky Way. The next moonless Perseid meteor shower will be in August 2018.